Once you’ve opened your Plot for the first time, it will be empty. Using the + button next to Objects, you can open the Inventory and add a variety of gear to your setup. The equipment is divided into categories, as well as Favorites and Recent (in the bottom toolbar). You can search for the object you’d like to find in the search bar (drag down on the table to reveal it). Searching in the categories list will display object types; searching within a specific category will display all variants of the objects in that category. You can save any type of Object as a favorite, except for Notes and Shapes; in other words, it should represent a real equipment item. This is a quick way to access and customize your most commonly-used items. To save or remove a favorite item, navigate to the object in the LD Inventory or the Crescit LightShop Library, select an existing object on your Plot and open its detail table, or select an item from the Truck. The ♥ symbol will appear blue if the item is already a favorite, and grey if it is not. Tap the button to add or remove the item. To see your list of favorites, open the LD Inventory table and tap the Favorites ♥ button in the bottom left corner. You can remove items in the Favorites table by swiping the row right-to-left. New in LD v3.3.3, each object that can be on the Truck has a new “model” property, which appears at the top of its detail table, above the nickname and below the object type. By default, this is the LD-given object type, but users can customize this property to indicate a more specific fixture. This is the name that the Truck will use to group and sort fixtures on your gear list, as opposed to the nickname, which is a less formal reference that doesn’t affect any groupings and is used only for display. The model of an object is saved with it when it’s added to Favorites, so if you’d like to use a specific fixture frequently, add it to your Plot, customize it how you like, and add it to your Favorites. Nickname: The blue text is the automatically generated nickname, which will display on the Plot layout. You can change this to whatever you like, at any time. Size: Some objects have different variants, like a Maxi-Brute 12-light, 9-light, or 6-light. Mount: Some objects can be mounted in different orientations, like horizontal or vertical Kinos. Wattage: Some Units have different possible bulb options, like 575w or 750w Source Fours. Beam: Some Units in the USITT category have different symbols when the beam spread is changed. Color: The Stroke and Fill colors displayed in creation tables represent the default colors that all your new objects will adopt. You can change an object’s colors at any time after you create it. Recommended Grip: Each object can have Grip gear tagged into it, if it requires a certain type of rig. You can check or uncheck the recommended gear to be created along with your object, and you can always remove them or add more later. + Add to Plot/Add to Object: This will create an object with the properties and Grip gear you chose, and place it in the middle of your screen. Some objects, like Grip and Gel, cannot be added to the Plot as a standalone object; they must be tagged onto other objects. When an object is selected on the Plot, this button will be enabled. Swap Object: If an object is selected and matches the class of the new object, you can swap them. All properties and relationships will be transferred over to the new object. Add to Truck: This will only appear if your Plot’s Truck is NOT auto-managed; otherwise you would need to add the object to the Plot in order for it to appear in the Truck. Add to Favorites: Tapping the ♥ adds the object type to your Favorites, which is a collection you make of your most-used objects. Once you’ve added a single object to the Plot, you’ll see control buttons. These actions provide the basic functionality of the object. Open the color pickers to select the stroke and fill colors for any object. Dragging the crosshairs allows you to aim your Unit, and releasing your touch sets that focus. If you focus the Unit on an empty area of the Plot, you are simply setting a rotation for the Unit; however, if you focus the Unit on another object, you will see a circle pop up around it. This means your Unit is now “targeting” that object. Wherever the object moves, your Unit will aim at it, and wherever you move your Unit, it will rotate to stay focused on its target. Note: You can also rotate an object by selecting it and performing a rotation gesture anywhere in the workspace. This will negate any Targeting a Unit is doing. Create an exact copy of an object; same type, nickname, notes, target (for Units), and will belong to the same Groups. When you tap the X, you’ll have the option of Deleting the object (which removes it from the Plot AND from the Truck), or just sending it to the Truck (which will remove it from the Plot but not change the number in the Truck). Note: If you do not have the option of Deleting, it means that another Plot in your Show requires as many of those objects as you’re currently using. As of version 3.5, you can add Units that look like anything you want. In the Inventory, open the Custom category, and tap the +Unit button to create a new Custom Unit. (All your Custom Units will be saved in this Custom category, so you can use them in multiple Plots once you’ve created them here. They will also be synced to any other devices signed into the same iCloud account.) Then, tap the image at the top to select an image from your device’s Photos. Note: I highly recommend importing custom images into LD soon after adding them to Photos. After an image has been in your device’s Photos for a couple days, it will be “optimized,” which will discard any transparency values. At that point you’d have to add it to your Photos again before adding to LD. Once an image is assigned to a Custom Unit in LD, it will be safe. Resolution: image must be made to a scale of 1 foot = 144 pixels, or 1 meter = 480 pixels. The size of the Unit is entirely dependent on the size of its image, so it’s important to get it exactly right if you want your Unit to appear to scale. Padding: the unit should have 30 pixels of padding around the edges with empty space. Colors: the image should have a transparent background (PNG format is recommended), with a black fill color and white stroke color. Lines: the “stroke” lines of the image should be 6 pixels wide to match LD’s built-in Inventory and Crescit fixtures. Direction: the front of the fixture should point to the right in the image. Above: two versions of a perfectly formatted custom image. 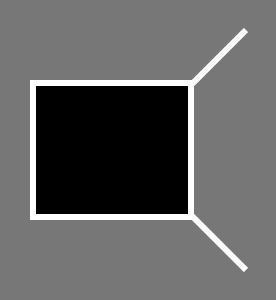 The grey represents transparent space (this must be actual transparency in your PNG file), the white will become the stroke color, and the black will become the fill color. The fixture points to the right side of the image. You can see the 30px padding around the edges, and the scale of 1 foot and 1/2 meter. The resolution is important because it makes sure the image will be sharp on any iOS device, no matter what kind of screen pixel density it has. This Unit can do anything a built-in LD Unit or Crescit Fixture can do, including change Stroke and Fill colors. Of course, there will be situations where you cannot (or don’t want to) use the image like any other LD Unit, so there are a few other display options. Blend Mode: when you select an image, a blend mode will be selected based on the properties of your image. If you create an image like the one above, with a transparent background and only black and white, stroke+fill will be selected by default and the Unit will behave like any other LD Unit. If your image has a transparent background but has some color in it, the image mode is selected, which means your image will display like it actually looks, and you cannot change stroke and fill colors. If you cannot create an image with a transparent background, your blend mode will be set to stroke, which means that you will only be able to set the stroke color of your Unit, and the fill will be transparent. Invert: if you can only get an image with black stroke and white fill, use the “Invert” switch to invert the image before the blend mode is applied. This makes black into white and vice versa, and will be turned on automatically if you have an image with a white background and no transparency. Once your image is set up, you can also configure your Beam Setup and wattage, and add a description. Then, you have your standard actions at the bottom of the table: Favorite, Add to Plot, Swap, and Add to Truck. The circular button shows the Unit’s Channel. This can be any number between 1 and 2048. (Channel 0 is a null assignment, which will result in no Channel being displayed on your Plot.) If you change the Unit’s Channel, and its Address was the same as the Channel, the Address will automatically be changed with it (to preserve the 1:1 patch). Similarly, if you change a Unit’s Channel, all other Units with that Channel and Address will be changed to match it. Tapping either button opens the DMX Picker; you can also assign channels and addresses in the Patch table, or in a Unit’s detail table, opened in DMX edit mode. Use a pinch gesture to change the length of the Rail. The Rail will set to any size, but if you have Snap enabled, or if you are resizing Truss or Dolly Track, it will only resize to even-numbered units of measurement. Use a rotation gesture to orient the Rail to the angle you like. This gesture can be over the Rail, but it can also be in any open area of the workspace, to make things a bit easier. The angle is displayed in the detail table. If Snap is enabled, the Rail will rotate in 15° increments. By dragging either end of the Rail, you can simultaneously change its length and rotate it. If Snap is enabled, the Rail will resize in increments and rotate to every 15°, but if it is disabled, it will move freely. A Rail moves and deletes just like a Unit. However, Rails are meant to have Units rigged onto them. To rig an object, just enable Snap and drag the Unit over the Rail; once it gets within a certain distance, it will snap onto the Rail and move only along its length. Some Rails have several different rails to rig onto; the rigged object will use the closest. To de-rig the Unit, drag it off the Rail. When the Rail is moved, its rigged Units’ targeting properties work just the same; Units that are targeting them will still track their movements, and rigged Units will still track their targets. Units that are not targeting anything will maintain their rotation relative to the Rail, as if they were really attached. If you make a Rail shorter and there are object rigged near the ends, these Units will be moved in towards the center of the Rail, as if caught and dragged by the ends. If you delete a Rail, all of its rigged objects remain on the Plot in the same positions, no longer rigged. Like a Unit, you can make an identical copy of a Rail on your Plot, but copying a Rail will also copy all of its rigged Units. This can be an easy way to make rigs like Par Bars; just make one, and copy it a number of times. A third major type of object is the Lift, which is like a Unit in many ways, but has no electrical, DMX, or targeting properties. Examples include dollies, aerial lifts, and furniture. You can rig objects to preset points on a Lift, or anywhere else over it. Its controls are identical to the Unit, just without the focus crosshairs. Gels can be added to the Plot or to any Unit on the Plot. You can manipulate them like a Unit or Lift except that they do not show rotation; their view is a circle, and their text will always obey text orientation settings. You can change text position, and where the Gel is placed relative to its Unit. You can also choose to “float” the Gel, which will keep it the same size on your screen, regardless of how you zoom the workspace. A Gel can also be a gobo, by adding an image from your device Photos. Select the Gobo option in the Gels & Diffusion category to pick your image, or choose from the many thousands of gobo patterns available in the Crescit LightShop Library. To attach a Gel to a Unit, just drag it over the Unit with Snap enabled. The Gel will move to its proper place based on the Unit’s display preferences, and also be added to any Groups the Unit is a part of. You can duplicate a Gel onto another unit by opening the Objects table and dragging a Gel’s colored + button over another Unit. An existing Gel will suggest similar Gels in its detail table; just use the picker to change to a different Gel, or select “Custom” to make a custom Gel based on the current color of the Gel. A Custom Gel can have its name, color, and transmission changed by the user. When on, the Note will automatically resize itself to display all of its body text. When off, you can resize it yourself. Note: If a Note has rotation values, they are not lost if Floating is enabled; disabling Floating will return the Note to its previous rotation. However, size and position values are changed when you enable Fit Text. Create and arrange Shape objects to set a background for your Plot. You can set the overall opacity of your Floor Plan in the Display Settings table. 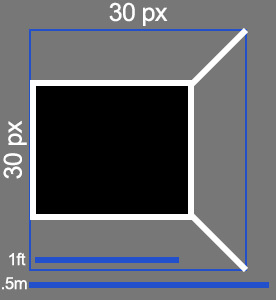 Square: A basic rectangle with a single border. Circle: A circle when it’s perfectly proportional, which stretches to a pill shape when it’s not. Line: Single line, which has the ability to snap its ends to the edges of some other Shapes. Door: This door will snap to the border of a Square, Circle, or a Line. Window: This window will also snap to the border of a Square, Circle, or a Line. Stairs: A basic square that draws steps inside its borders. Distance: Brackets that define any length on the Plot. Text: Editable text that can be resized by stretching. Tap and hold on the text to bring up the keyboard. Image: You can add any image from your Photos, and move and resize them. This can be a way to add one single floor plan image, or a number of custom objects. These images will keep their original aspect ratio as you resize them. When you create a new Shape, it will start with the default stroke and fill colors unless you currently have another Shape selected (in which case it will copy the stroke and fill of the selected Shape). All of these Shapes can be resized by dragging the circular handles on the edges and corners, and rotated the same way as a Rail: with a two-finger rotating gesture on the shape or in an open area of the Plot. If Snap is enabled, size will snap to every half-grid unit and rotation will snap to every 15°. Switch Hinge: (Door only) Cycle through the four combinations of hinge side and swing direction. Fill Color: (Fillable Shapes only) Open the Color Picker. Stroke Color: Open the Color Picker, which will include an increment/decrement control for stroke thickness. Replicate: Same as other objects. You can also see a list of all your Shapes the same way you can see a list of all Plot objects. It allows you to modify them in the same way, set their layering order, and navigate through their relationships to each other. Grip gear are more organizational and notational objects, and don’t appear on the Plot, but they can be “rigged” to Units, Rails, and Lifts, as well as added to the Truck. Examples of Grip gear are stands, clamps, stirrups, etc. These are good ways to indicate how certain objects are supposed to be rigged, or easy ways to get a count of how many of some piece of equipment you should order. Grip gear is copied when objects are replicated, so keep an eye on your objects’ detail tables for accuracy. A Null Object (found in the Notation category) is technically a Unit, but can be used as a focus point for other Units (say, rigged on a Rail), with the added benefit that you can choose to automatically hide it when rendering the Plot. To set this preference, go to the Display Settings and turn “Render Null Objects” on or off (it is off by default). You can also use it as a placeholder object to be chosen later, although there are several other choices in the Notation category for that purpose that will remain visible when rendered: a generic Light, for example, or a number of geometric shapes, all of which behave like any other Unit.